One thing I didn’t expect to see when I woke up this morning was an MP’s payslip. 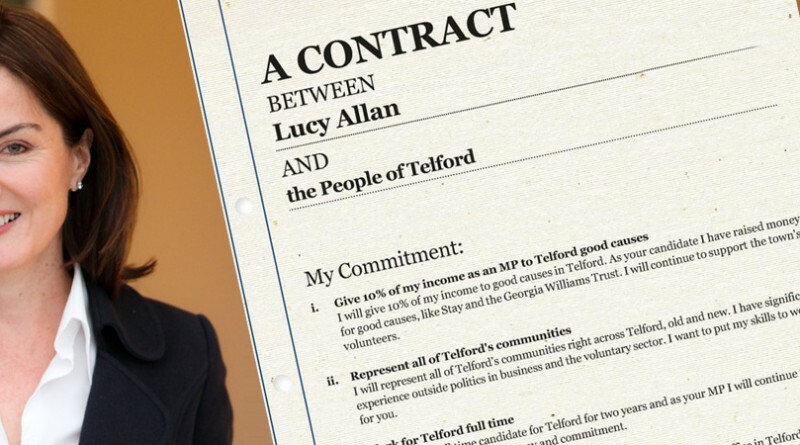 I’d arranged an interview with Lucy Allan MP in one of Telford’s many Costas. It had been just five months since the election, although both Lucy and I agreed it seemed much longer, and I’d not heard much about two of Lucy’s pre-election promises, namely to donate 10% of her earnings to local good causes and to be a full time MP. No sooner had we sat down, Lucy magicked out her bag a payslip, with four charities names on. Lucy: ‘The charities for the first year, each year will be different charities depending on what’s been happening during the year, are Telford Street Pastors because I’ve been out with them and they do fantastic work, Stay, Telford Mind, and Hilbrae Dog Rescue Kennels’. My first question now out of the way, I’ve seen the payslip. There is no denying that Lucy worked hard at getting the job. As a full time prospective candidate, barely a day went by when her Facebook or Twitter timeline stopped for breath. Indeed, the other pre-election promise that Lucy made was to be a full time MP and Lucy appeared a little embarrassed that since she was elected, spending more time in London means she struggles to keep all the plates spinning. ‘Pre-election I liked being able to speak to everybody whenever they needed something. The volume of emails, letters, phone calls is beyond belief. I have now recruited an experienced office manager who can help with this.’. A full time job it most certainly is. Another of Lucys chosen charities, Telford Mind is singled out as Lucy went on to explain how much mental health issues have affected her family. ‘Children are greatly affected by major life changes, and when they need help, they need help now, not a referral to a psychologist in three months time.’. Lucys experience will influence the work she does on the Education Select Committee. If, like me, you don’t really understand what an Education Select Committee is or does, Lucy explains; ‘It covers education of children from 0 through to 16 and I’ve asked to do a piece of work around mental health and in particular, mental health of children in care.’ The investigative committee is a cross party affair with powers to examine the work of OFSTED and call ministers in for a grilling. Every Wednesday the committee meet, just before Prime Minister’s Questions, it’s available on Iplayer for a while too, although I must warn you that unless you have a specific interest in education, it’s second only to Telford & Wrekin Council Meetings in the excitement stakes. One of the major decisions looming on the horizon is the change to the local hospital set-up which I’ve written about before. Lucy informs me that she has previously been a non-exec on a hospital trust. ‘What’s important is that there is continued investment on health care in Telford.’. It’s certainly an emotive subject and while ultimately it’s a local decision. Lucy is working behind the scenes with health minister Jeremy Hunt, to ensure that if it will be more expensive to have the full facility in Telford, this would not be a barrier to building it here. Another example where Lucy believes that having a marginal seat will help swing that investment. Despite the workload, Lucy still runs all her social media accounts herself. ‘I don’t think you should be paying someone taxpayers money to answer my tweets.’ Social media probably isn’t the best way to ask Lucy to take up your case, it’s hard to track, it’s also hard to tell if the person asking the question is actually in Lucys constituency.